Mahesh babu latest movie Brahmotsavam released on 22nd May 2016 and received mixed talks all over the places. Soon after the morning show social media twitter and Facebook are flooded with trolls on mahesh babu and Brahmotsavam and started trending #Floputsavam. There is no official statement regarding the hit or flop of the movie. 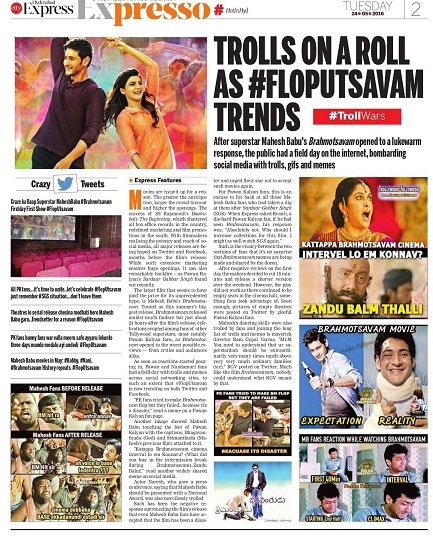 Without going through the official details Indian leading news paper Indian Express published a full page article on Mahesh babu Brahmotsavam movie with Title Troll on a Roll as #Flopotsavam trends with memes. After watching the article Mahesh fans took this matter seriously stared #WeLoveMaheshBabu showing their support for the start and also started trending #RIPIndianExpress expressing their anger. No only mahesh babu fans but fans of the stars have also lend their support on this issue. The article was written by Indian Express article writer vasanth kumar. There are some rumors circulation around the media is that vasanth kumar was given a hefty ransom from anti mahesh activists for writing the articles. Now the vasanth kumar has been fired from the job and fans asked an Apology letter with a bold letter on the front page of the Indian express daily newspaper tomorrow. As of now Mahesh babu has not given any official statement or response on this issue and media people are trying get his answer on this issue, meanwhile mahesh babu fans are planning to lodge a police complaint against Indian Express daily news paper and for insulting article on their star.